Our Goals Webelos is a 18 month program for 4th and 5th grade boys to prepare to join a Boy Scout troop while learning outdoor skills. A well-run group of Webelos is a gradual change from being an 'adult-run' den to being a 'boy-run' patrol ready to fit right into an adventurous scouting troop. 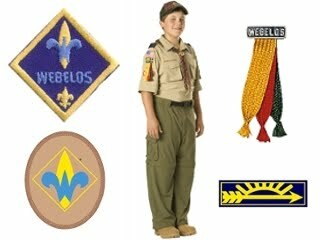 Ten Essentials- Here is a list of the 10 Cub Scouting Essentials- http://scoutermom.com/1228/outdoor-essentials-for-cub-scouts/ Please start gathering what you do not have. Don’t worry about the first aid kit, we have to make personal first aid kits for the First Responder requirement). Camping- at some point during the Webelos program, you have to Camp overnight and perform a number of activities during the Campout. The next Camping trip is at Pouch Camp in November. Whoever goes on the camping trip will work on the Camping activity. Camp-o-Ree- mark your calendars for Saturday, May 19, 2018. The Camp-o-Ree is a Boy Scout event at Pouch where Troops from all over the Island compete against each other in 6 or 7 events. Jr. Webelos Dens are invited as well to compete against other Jr. Webelos, so we will need everyone there. As it is an activity with the Boy Scouts, it also fulfills an Arrow of Light Requirement. 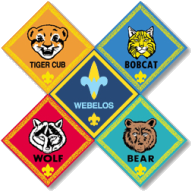 Webelos is an 18 month program which will (hopefully) result in everyone earning their Arrow of Light Badge and crossing over to Boy Scout Troop 37 in March, 2019. Our immediate goal is to complete the requirements for the Webelos Badge by the Blue & Gold Dinner in February. We have to complete 5 required activities and 2 electives. There is a lot to do, so we will be having at least 2 and sometimes 3 meetings per month. Some of these will have to be on the weekend, since we have to do a 3 mile hike and will have to go to Pouch at some point to work on fire building. Also, with The Tiger, Wolf and Bear Badges, there was a lot of leniency with the requirements. As Webelos is a transition to Boy Scouts, that is no longer the case. All requirements must be completed to earn the Webelos Badge this year and Arrow of Light next year. If you miss a meeting, it is your obligation to make it up.